If you have suffered from illness or sickness as a result of holidaying in Costa Caleta, you may be entitled to claim compensation from your tour operator. Whilst many holidays to Costa Caleta are a success, people do sometimes return from the resort with symptoms of illness that are suggestive of poor hygiene practices or a lack of cleanliness. Such symptoms often include diarrhoea, sickness, nausea and stomach cramps. Common complaints relate to poor food hygiene and poor swimming pool cleanliness. If you return home from Costa Caleta with food poisoning or an illness that has been caused by poor food standards or a lack of cleanliness at your hotel, European Regulations allow you to claim compensation from your tour operator in the UK provided you purchased a package holiday. If you are unsure whether your holiday was a package or if you have a valid claim, we are happy to provide free advice. Previously known as Caleta de Fuste, the resort rises from Fuerteventura's white sands and offers an attractive modern destination on the island’s Eastern coastline. An excellent choice for a diving or beach holiday! Simpson Millar’s specialist holiday lawyers check hotels abroad for illness and sickness outbreaks. These are often caused by holiday illness bugs such Salmonella, E-coli or Campylobacter. Salmonella Fact: There are hundreds of strains of Salmonella species which causes diarrhoea and stomach cramps to holidaymakers. Symptoms normally include diarrhoea, fever and abdominal cramps that can last from days to weeks. Simpson Millar’s Holiday lawyers deal exclusively with holiday and travel related claims and we have many years of experience in bringing claims against tour operators such as Thomas Cook, Airtours, Thomson Holidays and First Choice. All too often holidaymakers return home with foodborne infections, such as Salmonella or Campylobacter which can be caused by poorly prepared or undercooked food. Holidaymakers also often return with parasitic infections, such as Cryptosporidium, usually as a result of swimming in contaminated swimming pools. 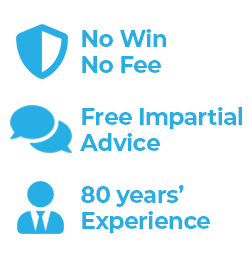 To see if you can make a “No Win No Fee” claim call us on 0808 145 1353 or complete our enquiry form and our experts we will provide you with free, no-obligation advice.